When we say Michael Muñoz was a big fan of political science, we mean that quite literally. Muñoz was an offensive tackle for the Vols (2000-04), and he tipped the scale at over 300 pounds. He was a two-time captain, an All-American, and was also cited for his academic excellence, tipping the GPA scales at 3.7. Academic counselors always tell the student athletes to sit in the front row so the instructor cannot miss them. Well, it certainly would be difficult to miss Muñoz in class. On Saturdays, he blocked the opponent’s defensive end. On Monday through Friday, he blocked the instructors from seeing most of the other students in the class. Michael’s father Anthony Muñoz was also an offensive tackle, an All American (but at Southern California) and went on to be an All Pro with the Cincinnati Bengals of the NFL. Some consider him the greatest tackle of all time. In 1998, Anthony was induced into the Pro Football Hall of Fame. He asked Michael to introduce him. Michael, just 18 years old made a big impression (literally and figuratively). He spoke about Anthony as a father rather than a football star. Thousands attended and millions watched the ceremony on television. If Michael was nervous, however, he managed to block it out (I could not resist). 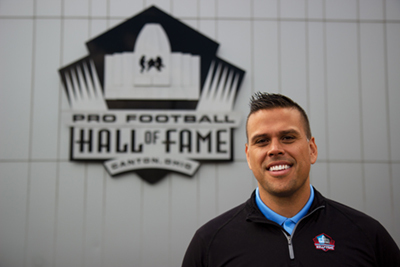 Michael moved to the Football Hall of Fame about a year ago and assumed a part-time position as the Hall's vice president of youth football and character development, a newly created position. Read more about our biggest recent alumnus, Michael Muñoz, in this recent Knoxville News Sentinel article.